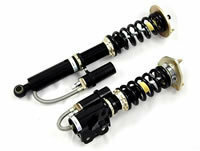 If you want to go that step further than just lowering springs you need a full suspension kit. These kits consist of a set of lowering springs, and matched shock absorbers which will drop the car from 20 - 60mm. These suspension kits lower the car, stiffen the ride and reduce body roll, which adds up to a car that is a LOT more fun to drive!